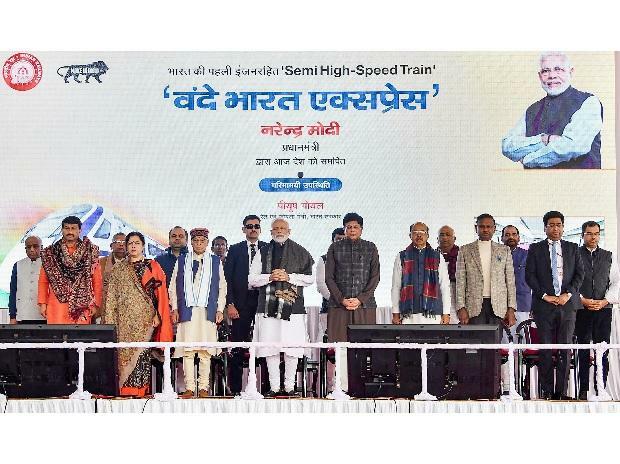 Prime Minister (PM) Narendra Modi on Friday flagged off India’s first semi-high speed train, Vande Bharat Express, from New Delhi Railway Station. Railway Minister Piyush Goyal was also present at the event. He, along with members of the Railway Board, boarded the train for its maiden journey to Varanasi. The mood at the event was sombre following the deadly terror strike in Jammu and Kashmir on Thursday that claimed the lives of at least 40 CRPF jawans. The flagging-off ceremony was also delayed by 90 minutes as the PM was held up in a meeting of the Cabinet Committee on Security. 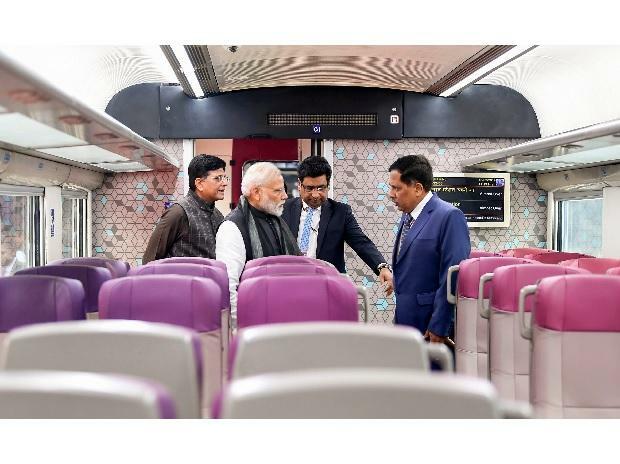 “I am grateful to designers and engineers behind Vande Bharat Express which will take its first trip from Delhi to Varanasi today (Friday). With our sincerity and hard work in the past four-and-a-half years we have tried to improve the railways,” the PM said. A sense of foreboding hung in the air as security was beefed up along the Delhi-Varanasi route. Guards manned the tracks and checked the train every 100 metres till it reached Dadri in Uttar Pradesh, about 40 km from New Delhi. Those who came to see the train at Kanpur and Allahabad stations en route shouted anti-Pakistan slogans. The train, running at a speed of 130 km per hour, was supposed to cover 750 km in eight-and-a-half hours. However, with the various checks on the route, the journey was completed in 10 hours. Usually, a train journey between the national capital and Varanasi takes 14 hours. The average speed of the Vande Bharat Express in subsequent journeys will be about 99 km per hour. Vande Bharat, however, will be slower than the fastest train in the country, Gatimaan Express, which can clock a speed of 160 km per hour. However, fare on Vande Bharat is higher. For a chair car ticket, you will have to shell out Rs 1,760. A seat in the executive class can be booked for Rs 3,310. “This fare is only 1.4 times that of a Shatabdi chair car ticket. We expect demand to be good, as we got more than 100 per cent booking for the first commercial ride on February 17,” said Girish Pillai, member (traffic), Railway Board. However, those travelling on this train might complain of discomfort later. The seats do not recline, as they do in a Shatabdi. Nor do they have LCD features of the Tejas. The finish of the coaches is also not perfect. On the inaugural journey, one could spots signs of the fact that its maker, the Integral Coach Factory in Chennai, was rushed. Vande Bharat has 16 coaches and can ferry 1,128 passengers. It was conceived and executed in 18 months. The engine-less train has a toilet and a mini-kitchen for drivers. It is equipped with automatic doors, bio-toilets, Wi-Fi, and an audio-visual passenger information system. Better food may also be available in subsequent journeys, with Indian Railway Catering and Tourism Corporation tying up with restaurant chains such as Pind Baluchi and Monginis. Indian Institute of Hotel Management will provide breakfast to passengers.